Spend more time in the moment with your instrument, and less time managing the computer. With PACER you'll have full control of your most vital DAW functions with a simple tap of your foot, leaving your hands free for playing and performing. 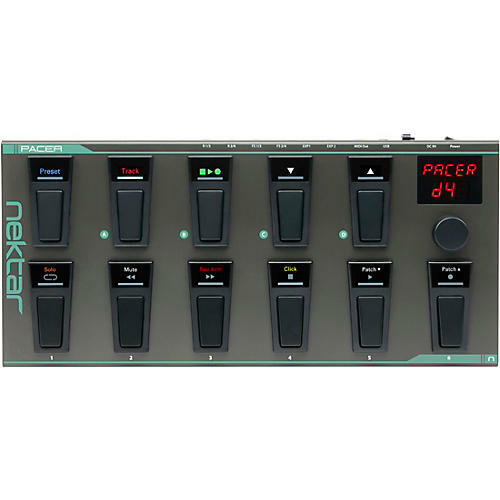 PACER integrates 10 programmable LED foot switches in a rugged and stage-ready box, with four switching relays and connections for up to four external foot switches and two expression pedals. That's a lot of switching power right at your feet: With just one press of a button, you can send up to 16 MIDI and relay messages to reconfigure a setup instantly. Pacer's programming options are extensive. In the most basic state, a switch can send a MIDI message or change a relay state. But being able to send MIDI messages in a sequence of steps, takes the usefulness of a preset to another level. Use one switch to step through program change messages during your song and the other switches are free for FX on/off control. Or switch your amp channel, start playback in your DAW and change program on your effects rack, all by pressing a single button within the same preset. Another 16 MIDI messages/relay settings can be programmed for triggering when each of the 24 presets are selected. Whether you are looking for a simple pre-configured solution to control products such as Line 6, Kemper Profiler, AxeFX and Avid Eleven, want to control your DAW without letting go of your instrument or plan to create your own advanced setups for controlling a live show, PACER does it all. Don't stop the music: PACER is a true hands-free option for controlling a DAW and features a complete set of dedicated track and transport controls. For MCU (Mackie Control Universal) compatible DAWs, a Transport preset provides control over Cycle/Loop, Rewind, Forward, Stop, Play and Record. Each switch has its own large icon illuminated by an RGB LED to show the current status. The Track preset controls Solo, Mute, Record Arm and Click. Almost every DAW is compatible with MCU including Ableton Live, FL Studio or Sonar. Nektar DAW integration provides the highest level of integration with additional options for track and patch selection, customized RGB LED color feedback and in some cases additional functionality. Nektar DAW integration supports Bitwig, Cubase, GarageBand, Logic, Nuendo, Reason, Reaper and Studio One. PACER has 10 programmable foot switch controls, each equipped with an RGB LED. Add to that a crisp and large two row LED display, a dedicated switch for Preset recall and an encoder with push switch for programming, navigation and control. So PACER definitely won't leave you in the dark, figuratively speaking: Depending on the active mode, the top or middle row icons are illuminated. The RGB LEDs in the bottom row display switch status. A red LED display with two rows shows the active preset name/number, mode and selected parameter and value. The data encoder with push switching right next to it makes parameter selection and programming swift and easy. Each foot switch has its own RGB activity LED and function LEDs, which are also part of a preset: So if you'd like a switch to use a different color or LED, you can easily customize that. PACER has 24 presets. Any switch can be programmed to select a preset, but pressing and holding "Preset" and then selecting a bank & number is available at any time. As mentioned above, each control within a preset is programmable with up to 6 steps or actions. What's more, these steps can be sent simultaneously or in a sequence of presses. When you load a preset, up to 16 MIDI-messages or switch states can be sent at the same time: Just one stomp can have a dramatic effect.